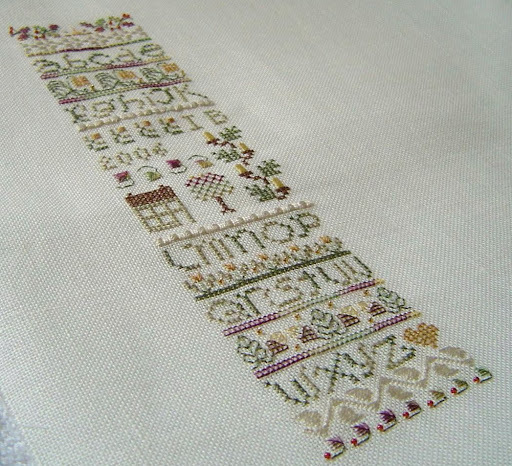 Back in the day when I used to do embroidery, one of my favourite designs was Summer into Autumn, by the Drawn Thread. I loved everything about it – the rich colours, the threads used, the texture of the specialty stitches. But most of all the colours. When I first tried this dress on, I was instantly reminded of the above-mentioned design. The fabric comes from Boeken‘s in Amsterdam. I bought it a year ago, on my last stay there – it was beautiful, high quality (this dress only uses 1.5 meter but probably cost 18 euros to make), and therefore stayed in my stash long enough for inspiration to strike and for me to gain confidence in cutting into the fabric. Karen just wrote a great post about this exact feeling. I used this pattern almost two years ago. Funny how changes in the length, sleeves, neckline and the overall outfit make the two versions utterly different. The pattern once again came together easily and beautifully. This is from the Threads collection, so extra attention was paid to details. I still hold by my review of the first version. My only change was the addition of a back tie to help cinch the dress a bit. I hemmed the dress by hand with an invisible stitch. I love the way it makes the hemline hang – not just visually, but also in the way the dresses falls on me. Actually it is the matching sandals that make this outfit very special (though the fabric is beautiful). Bravo! Such a beautiful dress. I adore the fabric on you, and the pattern placement is so perfect. It is lovely to see you enjoying the dress in the sunshine on your picnic. It's gorgeous! I LOVE that fabric also. You are right, it's the perfect summer to fall transition dress. Great job! Very pretty dress, the fabric is fantastic. Your dress fits you beautifully, and the design and fabric is gorgeous. You are right in that it matches the crossstitch project perfectly. Very cute dress and I love the colors of your fabric! I bet you will get a lot of use from a dress like that in your new locale. Thanks for sharing your new projects! What a wonderfully flattering dress! What a great transitional dress! Enjoy those lovely warm days and picnics. Lovely dress and great print. The dress is cute and those sandals with the flowers definitely rock!! Absolutely beautiful. The dress is fabulous on you. Ta robe est tout simplement splendide ! J'espère que ta rentrée s'est bien passée. This version of the pattern is beautiful. The color and the fit perfect on you, the neckline really looks pretty. I have the long sleeve version of this dress in the muslin stage, I need to get it done! I love looking at your sewing, Isabelle, but I'm happy that yours was one of the first stitching blogs I ever found. I feel like I've found such a great friend in you, although we've never met, and I often refer to you as my friend in conversation. I love everything about this dress! It lays just right on you and I love the pattern in the fabric. Great job, as always. Very lovely dress on you! Moi aussi, I love to embroider but find I have no time for it anymore. Both fabric and style of this dress are stunning! But optional kitty is perfect…how cute is that! Very pretty! The fabric is gorgeous, I can see why you waited for the perfect fabric but I'm glad you found the courage to cut into it! What a beautiful dress with a great combination of pattern and fabric. I also love the previous black dress. Makes you look fatter? You must be kidding, you look spectacular in it. Another chic dress! How do you do it? Love the fabric, love the pattern. Its great seeing what others across the globe are making. Gorgeous dress and great use of that special fabric! Wow, you cross-stitch too! Amazing work. Love the dress. Those colors are right to my taste. I could almost want it to be Autumn all year long. This is my favorite season. What a lovely dress Isabelle. Glad to see you are doing well and enjoying your new home and job. That fabric was just waitingn around for you to decide to use that pattern with it, it's obvious. A beautiful result, and I love the picnic shots – always nice to see the dresses in action. Wow! What great thinking on the top. It came out great with the layering. Love the dress! The sandals are a perfect match for it. Your stitching is beautiful! Maybe one day you will have more time to do more. Drawn Thread is a great designer! Hello from Paris, Isabelle. I'm here for a month. This is my absolute favourite item that you have EVER made. I love it!! !